Mangoes are so cheap at the moment. I have a bit of a love/hate relationship with mangoes. I love them green in a salad, I like them when they are a bit softer, not too ripe, sweet but still with a tang. But when they get really ripe I loathe them, they have a volatile smell that just makes me feel ill. But this week I bought six perfectly ripe ones to make some mango with coconut sticky rice for dessert at my Mum’s birthday. This dish has become a family favourite after my sister spent a couple of years in Thailand. We all ate it when visiting and have all fallen in love with it. It is easy to make and is so delicious, a combination of soft, sticky, sweet, tart and salty. Soak the rice in warm water for at least 10 minutes and drain. Line a steamer with a piece of baking paper that is cut to be smaller than the steamer and punch a few holes in it. Add the rice onto the paper. Steam the rice for 20 minutes or until done. Soak the rice in warm water for at least 10 minutes with the water covering the rice by about ½ cm. Put a plate on top of the bowl to cover it and microwave on high for 3 minutes, stir and microwave for another 3 minutes. If it needs any further cooking, do this in bursts of 1 minute. It is easy to overcook and you want the grains still identifiable, not a bowl of mush. Once the rice is done by whichever method you choose, put the cooked rice into a bowl. Mix the coconut milk, sugar and salt in a small saucepan and bring to a gentle simmer. Remove from the heat and pour ⅔ of it over the rice and gently fold in. Don't worry too much about mixing it, the warm rice will absorb the coconut milk. 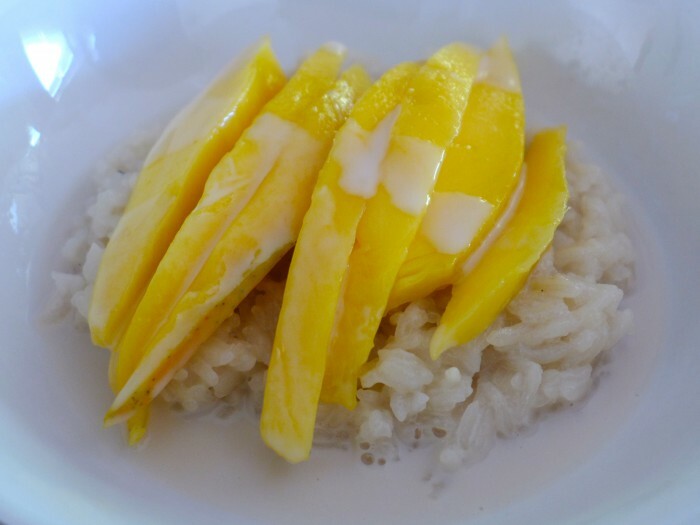 Place a portion of the rice into a serving bowl, top with sliced ripe mango and pour over some of the reserved coconut milk mix. Possibly a stupid question but….I’ve never tried “steaming” rice before although read it on sooo many sites! Yes it would work in a tower steamer provided the holes aren’t too big, but the paper makes it easy to get out. And yes you drain the soaking water.